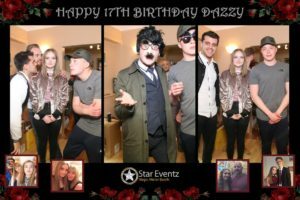 This Saturday 6th May 2017 we were in Grantham, Lincolnshire to bring the Magic Mirror to host Dazzy’s 17th Birthday party, and what a party it was! Everyone had a great time right from the beginning and to top it off for us we were greeted with a rum cocktail on entrance, which as you can imagine went down a treat! 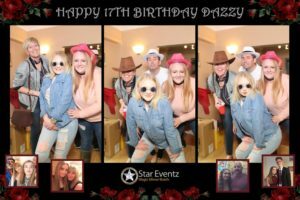 The photo booth was set up with no mishaps and within minutes it was in full swing doing its thing and keeping the host Dazzy and her guests fully immersed and entertained throughout the day. It went down fantastically with everyone there, everyone wanted to have a go and some great photographs were taken! It was a big party and there were lots of people including her friends, boyfriend, family and siblings and lots of entertainment for everyone of all ages. Not only did Dazzy have the Star Eventz Magic Mirror at her birthday party, but she also had a bouncy castle and an inflatable penalty game to keep the younger ones entertained, so the kids were completely made up! Our favourite (apart from the Magic Mirror of course!) was the DJ who was great and played some sweet tunes, he also had a good selection of music for all to enjoy. 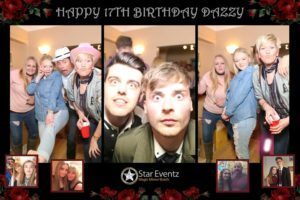 We haven’t had so much fun at a party like this for a long time and seeing people enjoying themselves so much makes us very happy to be running Star Eventz. To top the night off for everyone there was a surprise for the host’s mother Helen when her sister who lives miles away and had previously said it was impossible to attend turned up with her family so there were lots of tear of joy. We loved this! This is why using a photo booth to bring people together at social events is an excellent choice and helps you capture those special moments like this one! Everyone young and old enjoyed themselves and I’m sure we will see some of them again. All in all a wonderful day with a wonderful crowd of people and Darielle and her friends thoroughly enjoyed themselves, I’m sure they had a night to remember for ever. That’s our mission accomplished. Thanks for having us Darielle and Helen, we hope you had a great time and enjoyed having the Star Eventz Magic Mirror at your birthday party, we hope to see you all again soon.